The Chugiak Dog Mushers Association promotes the sport of dog mushing with emphasis ​on care, training, and responsible breeding of sled dogs. Our membership covers the full range of sled dog enthusiasts - from armchair mushers to junior, recreational, and competitive racing teams. 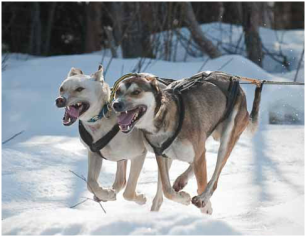 Our trails and activities are vital to the sport of dog mushing in southcentral Alaska. We welcome spectators, new mushers, and volunteers to participate in a full spectrum of fun, educational, and competitive events hosted by the Chugiak dog mushers. ​Board meetings are held at 7 pm the first Tuesday of every month at the CDMA clubhouse on Beach Lake Road. All members are welcome to attend.